Also, you may reference the "COMU Credentialing SOP" and "ESF 2 Communications Quals" documents on the right to learn how to achieve state credentialing for Amateur Radio. 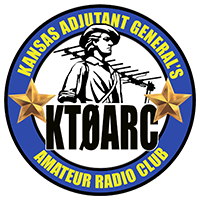 The Kansas Adjutant Generals' Amateur Radio Club was created in January of 2014. The mission of the club is to bring together those interested in amateur radio and it's use in public safety. The immediate goal of the organization is to ascertain and robust where necessary the current amateur radio capabilities available within the agency. The group is here to support all emergency service amateur radio organizations such as ARES, RACES and MARS. Membership is open to all those interested in amateur radio and public safety. Employment in the Adjutant General's department or membership in the Kansas National Guard are not required. Membership fees are $20/yr payable in January. Those joining after July first in any year will be charged $10. For membership information, contact the club secretary, Greg Overfors at: finn21@cox.net. The purpose of Kansas RACES is to provide Emergency Management with Amateur Radio Communications through networks using State/County and/or privately owned equipment, authorized under the Federal Communications Commission (FCC). and operated by licensed Radio Amateurs in the Radio Amateur Civil Emergency Service. The Kansas Department of Emergency Management's Response and Recovery Branch is the legally appointed authority for all matters pertaining to RACES Radio Nets used for Emergency Management in the State of Kansas. This authority may be delegated to the State RACES Officer. b. Provide auxiliary communications for DOD, Federal, National Guard, civil authorities, and local agencies as directed or requested in accordance with Defense Support of Civil Authorities (DSCA) policy and directives (see DOD Directive (DODD) 3025.18). c. Assist in effecting normal communications under emergency conditions as directed or requested. authorized U.S. Government civilian and contractor personnel stationed throughout the world. f. Initiate efforts to improve high frequency (HF) and very high frequency (VHF) radio operating techniques and technology through training, experimentation, and testing. g. Conduct an appropriate cross band activity as an integral part of the annual Armed Forces Day activities. h. Develop volunteer personnel trained in military radio communications, techniques, and procedures.